So,...............Whats your thinking on Uberti Replica SAA Pistols ? I'm thinking seriously about Uberti's El Patron Competition to get the lower wider hammer, a bit wider sights and the spring upgrade. I'm also going to go with Stainless Steel for outdoor use and easy finish touch up. I also want to take advantage of Uberti's fire control system that will allow safe carry with 6 rounds in the cylinder. I couldn't find this model in Tulsa a week ago, so I did what I could to move this project along...............I bought the El Paso Gun Leather there, from a stocking dealer at a very good price....LOL! So, those of you that own and shoot Uberti's............What can you tell me about them? Last edited by Tomray; 04-13-2019 at 12:22 PM. Cowboy23*, Ret_Eng, rob42049 and 4 others like this. I have a friend that has that exact same gun. Accurate and he loves it.......Looks good too. Tomray and M1Riflenut like this. Back in Gilbert Arizona for good! I have two Uberti cattleman 1873's and I am very impressed with them and I shoot them often. One in 45Colt and the other in 357mag. I can say the fit and finish on mine are top notch and I wont hesitate to buy other offerings from Uberti. The cylinder lockup on mine are nice and tight and correct. The triggers right out of the box had no perceivable creep and both are just a hair over 2.5 lb triggers. Of all the firearms I own, these are in the special pile of goodies that I have not found a need to tinker with or "improve" anything on. Almost every other time I shoot anywhere, I bring one of them out. they're just a hoot to shoot and haven't given me the first issue. 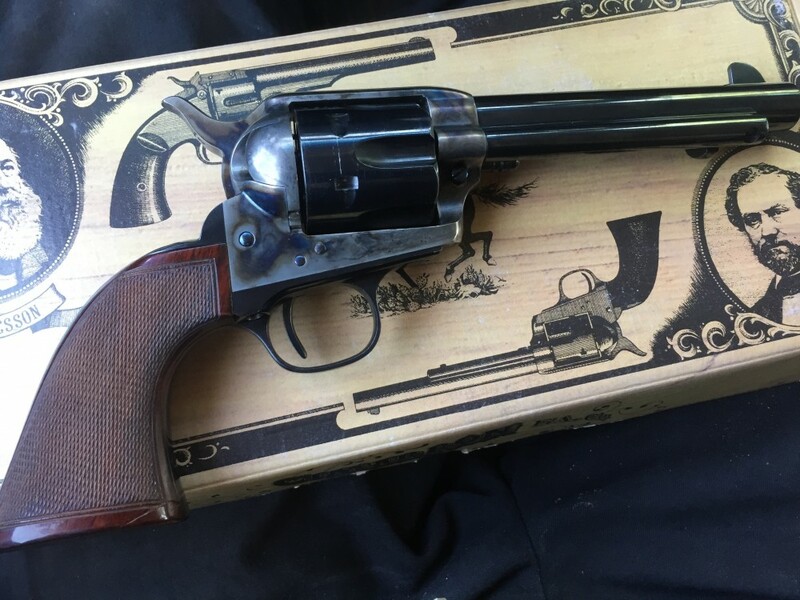 I will recommend Uberti's to anyone looking for a quality Single action replica. I own an original Colt and I honestly think the Uberti's are better and more "precise" to be completely honest. Last edited by flatsneck; 04-13-2019 at 03:59 PM. Tomray, electricmo, M1Riflenut and 4 others like this. I have not looked at one lately but I'm wondering if Uberti made them to the same Colt dimensional specs or if they beefed up the thickness of metal between the chambers ? For a working gun more meat between chambers is good. I did this on a special custom 45LC Ruger I had made by John Linebaugh where he made a beefier 45LC cylinder 6 shot for me. It can hold hotter loads of 45LC with no worries about the cylinder giving out. Tomray and flatsneck like this. Uberti Cimarron Evil Roy .45 Colt. This is the upgraded version with hand-fitted springs/action job and hand-cut checkering...plus the color case hardening. I too have found nothing to upgrade on mine and I'm generally a tinkerer. Tomray, flatsneck, Travlin and 4 others like this. 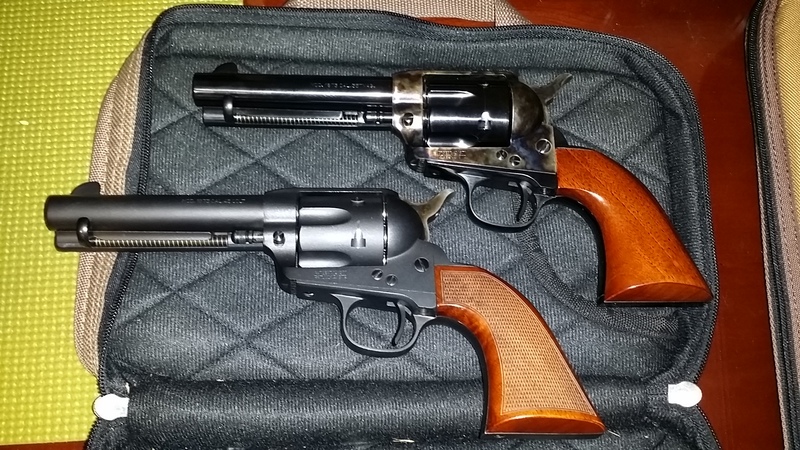 I don't have that exact model--but the Ubertis I have bought have been great in 44 SPL and 45 Colt. I shoot cast in all of them with either Trailboss or 800-X. No complaints from me! I have the old style models that need to be loaded with 5 rounds. I have a few Uberti's, but only one has the new "safety" system, as most of them are older production. The quality on them is very good, and they seem to function well. Another thought might to go with Pietta. They have a model (designation on the ones I have is SA73-1911LC), that has a lowered, wider hammer, an 1860 Colt style grip frame (longer than standard), and an octagon barrel. It also has a "transfer-bar type" safety system to allow for safely carrying 6 rounds. I used a pair of these for cowboy action shooting, in 45 Colt, with a 5-1/2" barrel, and had absolutely no complaints at all. Not all Pietta's have the safety system, so you have to watch carefully. I got mine through Cabela's, so that should give you some place to start looking if you're interested. Listed price on line is about $400 bucks. Of course, there is always the Ruger Vaquero. Hard to wrong with those, especially in stainless steel--very durable for a field gun. Tomray and M700 like this. The reason I wanted a Uberti was to NOT have a transfer bar. It's the reason I did NOT buy a Vaquero (that and an original size Vaquero in .45C with a 5.5" barrel and a decent price face to face is impossible to find) AND it is why I did NOT buy the Beretta version either. Last edited by GasGuzzler; 04-13-2019 at 04:22 PM. rob42049, flatsneck, Skyhunter and 1 others like this. I had a Uberti made Beretta Stampede about a decade ago that had the transfer bar safety. It shot great, but just didn't feel like my Colt or USFA. It just felt different and looked different. The take up in the trigger and not seeing a firing pin on the hammer made it a red headed step child. I basically gave it to a friend of mine who shoots it all the time and couldn't be happier. Yes, I understand about the look of the hammer w/o a firing pin and how the "feel" could be/is different.............I really like the feel of my USFA's and Colts, but they are becoming too valuable to use as a working gun. I know, I've always said "I'm not saving my firearms for someone else", but this all just seems like the smart thing to do................Besides, I just want another new gun, to keep life interesting! Re: the Vaquaro's.........I'm sure they are fine working guns, but I want something a bit more authentic and of the proper weight............Not to de-grade the Rugers.........Everyone knows they are very strong, and can be loaded quite hot................probably far above any of the Replica's. Thanks to all for the replies..........I'm happy to see so many positive replies. Steve_In, flatsneck, 256WinMag and 1 others like this. Uberti 44-40 DOM 1995 SAA, new to me.